Valley Forge installed the new Sutherland 660-ton Hot Forge Press with the FLST, and has been successfully forging extra-long bolts ever since. The project became a multi-year collaboration, reviewing existing processes, and developing new targets for safer production and higher output. For more than 40 years, Valley Forge & Bolt Manufacturing Company has been an international leader in producing high-quality hot forged industrial fasteners. Valley Forge is known for their unique, patented MaxBolt load indicating fasteners. Each MaxBolt features a tiny built-in gauge indicating the level of tension on the bolt, allowing for real-time visual feedback that becomes indispensable for managing risk when there’s zero room for error. This makes MaxBolt fasteners essential for the kind of projects that Valley Forge’s clients are involved with, including sub-sea platforms, mining equipment, nuclear laboratories, oil & gas facilities, construction cranes, and power plants. In order to operate at the level of reliability and efficiency required for these high-stakes jobs, Valley Forge needs to have the best equipment on their factory floor. Ron Clarke, President of Valley Forge, contacted Sutherland Presses of Malibu, California to discuss a new approach to the process of making extra-long bolts. The project became a multi-year collaboration, reviewing existing processes, and developing new targets for safer production and higher output. Towards the beginning of the partnership, it became clear to Ron that Valley Forge had an area of opportunity uniquely suited to the strengths of Sutherland Presses: “The conventional forge presses we had were not ideal for long bolt heading. They forced us to have more moving and rotating parts in our dies in order to load and extract the long bolts. 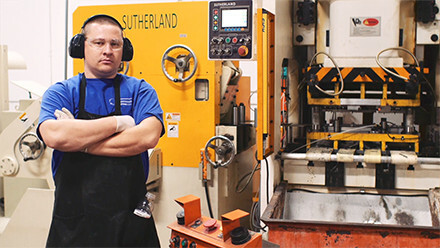 When we met with the team from Sutherland, they came to the table with a fresh idea for a Front-Loading Sliding Table (FLST) Forge Press.” The FLST has become a signature innovation from Sutherland Presses, having been previously implemented with aerospace clients for similar extra-long bolts. Valley Forge installed the new Sutherland 660-ton Hot Forge Press with the FLST, and has been successfully forging extra-long bolts ever since. Ron is quick to elaborate the advantages: “Due to the Front Load design, the press can be operated manually or automated. There’s less heat loss due to the faster heater-to-forge cycle which creates better material flow, and the precise, close-tolerance slide guide structure has improved die life.” The extra-long bolts being produced by this press will go on to secure the most vital connections needed to build the heaviest industrial equipment. All of these applications are made possible by the essential partnerships between industrial innovators like Valley Forge and Sutherland Presses.